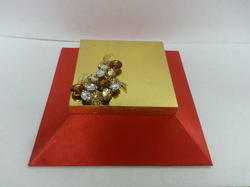 Rigid boxes can have combination of Fabric and board. Description : Multi purpose upholstered trunk that works great as a bench too. Fabric box with Tie and Chocolates elegantly packed in butter paper sleeves. Boxes can be in company colours and of fabric of your choice. Ties can be chosen according to budget and customized with logo. This box is covered with hand block printed BAGRU print cloth.Inside linning is of hand made paper. By keeping track of current market development, we are into offering an excellent range of Fabric Packaging Box (Pink Fabric Box). Over the years, we have acquired great expertise and technical knowledge in the manufacturing of Fabric Box, which are of premium quality. 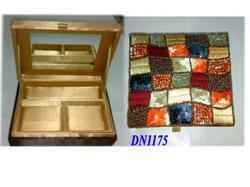 Backed by a rich industrial experience, we are engaged in offering a commendable array of Leather Fabricated Box. These are made by using quality-tested material and modernistic technology by the experts. We offer these to our customer at most economical rates. Woven Silk Necktie or Micro Jacquard Necktie, Cufflinks, Pocket Square, in an exclusive Fabric Inlaid Lid Gift Box.